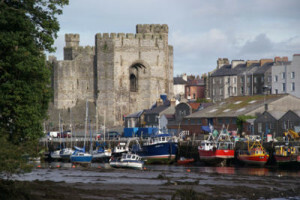 Caernarfon Castle,begun in 1283 by King Edward I, is one of Europe’s greatest medieval fortresses. The castle is is magnificently preserved and dominates the town. It was the setting for the investiture of Prince Charles as Prince of Wales in 1969. 6 miles from Graianfryn. Open all year except Christmas and New Year. Conwy Castle was built between 1283 and 1289 by King Edward I. Around 1500 craftsmen and labourers were needed to construct this outstanding example of medieval military architecture. 17 miles from Graianfryn. Open all year except Christmas and New Year. Criccieth Castle was built by the Welsh prince Llewelyn the Great between 1230 and 1240 but was captured in 1283 by King Edward I. Criccieth held out against a long siege by the Welsh rebel Madog ap Llewelyn in 1294 but yielded to Owain Glyndwr in 1404. 23 miles from Graianfryn. Open all year except Christmas and New Year. Dolbadarn Castle overlooks Llyn Padarn in the Llanberis pass. 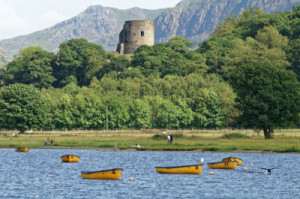 This small castle of which only the 40ft high tower remains, was built by Llewelyn the Great early in the 13th century. 4 miles from Graianfryn. Open summer only. Dolwyddelan Castle is another of Llewelyn the Great’s 13th century fortresses. It’s solitary square tower rises impressively above the rugged landscape. 22 miles from Graianfryn. Open all year except Christmas and New Year. Rhuddlan Castle, begun in 1277, was the second castle of King Edward I’s Welsh campaign. It featured a protected river dock for shipping on the river Clwyd and a massive diamond-shaped inner ward. 32 miles from Graianfryn. Open 1st May to 30th September. 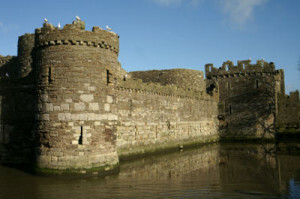 Beaumaris Castle on Anglesey was the last and largest commissioned by Edward I. Work started in 1295 but was never completed, even though 400 masons and 2000 labourers were employed. Overlooking the Menai Straits, Beaumaris is considered the best example of the concentric design. 12 miles from Graianfryn. Open all year except Christmas and New Year. Harlech Castle,constructed between 1283 and 1290, by King Edward I, is perched on a rock above Tremadog Bay. Protected by cliffs on three sides, Harlech was almost impregnable, and was the last Royalist stronghold to fall in the Civil War. 40 miles from Graianfryn. Open all year except Christmas and New Year.